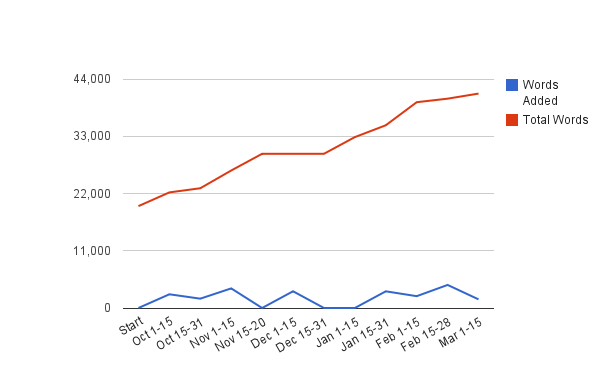 Guest Post: How Does Your Dissertation Grow? I’m excited to introduce, Meg Dickey-Kurdziolek, PhD Candidate in Computer Science at Virginia Tech, and author of the following guest post. Make sure to check out Meg’s website. She also welcomes you to contact her by email (meg.kurdziolek@gmail.com) or on Twitter (@megak). I started dissertation writing in earnest back in October 2010. I started by taking my proposal defense document, reorganizing it a bit, and adding from there. Besides some holiday time setbacks, I’ve been making some slow but steady progress on my dissertation. In the beginning, I believed that my dissertation would be somewhere around 50,000 words when it was done. 50,000 is the average number of words for a novel so I figured that would be a good estimate for my dissertation. However, I think my dissertation might be longer than that in the end. I recently crested the 40,000 word mark and I still have a couple chapters left to write and literature review to add. Perhaps mine will be more like 60,000? I’ll let you know when I get there. I wanted to take a time-out from dissertation writing for a few minutes so I could share some of my recent obsessions and strategies that have been helping me a long. One of the dirty secrets of getting a PhD is that it makes you a little bit crazy. Those crazy professors you know weren’t always that loony and absent minded – their PhDs made them that way. It’s all part of the graduate school process, which reaches its climax during the dissertation writing phase. It is during this time that most graduate students develop a few obsessive-compulsive habits. The most common OC trait that dissertation writers share would have to be compulsive saving. Everyone knows that you should make back-ups of your work, but how important is it to make sure copies of your data are contained on a multitude of different devices spread across the globe? I currently have copies of all my data living on 1 machine and 1 external hard drive in the lab I work out of at Virginia Tech, 1 external hard drive in my house in Virginia, and 1 external hard drive and 1 machine that I have with me currently while I do some work in California. I also keep copies of just my dissertation document saved on 2 USB thumb drives: 1 thumb drive I leave in my backpack with my laptop and 1 thumb drive stays in my purse so I can keep it on my person at all times. I also periodically email my dissertation to my gmail account so there is a copy in the cloud, you know, just in case. I am certainly not alone in the “obsessive compulsive save data in case the zombie apocalypse happens” department. (I don’t care if my committee members are zombies just as long as I can interpret their cries of “brains” as “you pass”.) My friend Mat Grove told me he made sure that his dissertation was saved on servers located on two different continents. You can never tell when the whole countryside will erupt into flames and there is a possible post-doc waiting for you in say, Iceland? Australia? Easter Island? I’ve discussed my compulsive saving habits with many of my fellow PhD pursuing friends. One of my friends and fellow Virginia Tech CS graduate student, Amine Chigani, just recently recommended getting a free Dropbox account. Dropbox gives you the experience of an external hard drive but all your data is actually saved in the cloud. Your Dropbox data can also be accessed from any machine that connects to the internet. It sounds like a good solution for the obsessive compulsive dissertation saver on the go. Back in the fall my friend Laurian Vega and I started a “300 words a day” accountability club. Every day we would txt each other with our daily word counts and cheer each other on. Whenever one of us failed to add 300 words there would be some sort of “punishment”. (Most of the time the punishment was just a sense of shame and possibly some name-calling.) Its sorta like having an accountability partner for exercise. You are much more likely to “show up” if you know someone is expecting you to. I recently joined the “Shut Up & Write!” meet-up group for the Silicon Valley. The meetings are exactly like the group name suggests – everyone meets at a designated location, we have about 15 minutes of social “get-to-know-you” time, and then we are instructed to shut up and write. Everyone writes for about an hour, and then you are free to leave or start socializing again as you like. Through this group I’ve met some very interesting people who love to write. Most of them are writing novels or screenplays, but they are perfectly a-okay with having a dissertation writer in their midst. I find that I actually get an incredible amount of writing done at these meetings. Besides having friends who are also going through or have recently gone through the dissertation writing phase, its nice to read some funny blogs and comics about it too. Of course, everyone reading this has found the To Do: Dissertation blog. I’m also pretty sure most of the people who would read this blog have also seen PhD Comics before. Those are always good for a pick-me-up when you have the phd blues. If you are a fellow dissertation writer and want to share some of your strategies with me (or just commiserate) then I’d love to hear from you. You can find me via email (meg DOT kurdziolek AT gmail DOT com) or twitter (@megak). Want to submit a guest post like Meg? Email your post to tododissertation [at] gmail [dot] com!